2. Large promise. The second most important decision is this: what should you promise the customer? A promise is not a claim, or a theme, or a slogan. It is a benefit for the consumer. It pays to promise a benefit which is unique and competitive, and the product must deliver the benefit you promise. Most advertising promises nothing. It is doomed to fail in the marketplace. “Promise, large promise, is the soul of an advertisement” – said Samuel Johnson. 3. Brand image. Every advertisement should contribute to the complex symbol which is the brand image.Ninety-five percent of all advertising is created ad hoc. Most products lack any consistent image from one year to another. The manufacturer who dedicates his advertising to building the most sharply defined personality for his brand gets the largest share of the market. 4. Big ideas. Unless your advertising is built on a BIG IDEA, it will pass like a ship in the night. It takes a BIG IDEA to jolt the consumer out of his indifference – to make him notice your advertising, remember it and take action. Big ideas are usually simple ideas. Said Charles Kettering, the great General Motors inventor: “This problem, when solved, will be simple.” BIG SIMPLE IDEAS are not easy to come by. They require genius – and midnight oil. A truly big one can be continued for 20 years – like our Eyepatch for Hathaway shirts. 10. Don’t bury news. It is easier to interest the consumer in a product when it is new than at any other point in its life. Many copywriters have a fatal instinct for burying news. This is why most advertising for new products fails to exploit the opportunity that genuine news provides. It pays to launch your new product with a loud BOOM-BOOM. 13. Problem-solution (don’t cheat!) You set up a problem that the consumer recognizes. Then you show how your product can solve that problem. And you prove the solution. This technique has always been above average in sales results, and it still is. But don’t use it unless you can do so without cheating: the consumer isn’t a moron. She is your wife. 21. Animation and cartoons. Less than five percent of television commercials use cartoons or animation. They are less persuasive than live commercials. The consumer can not identify herself with the character in the cartoon and cartoon’s do not invite belief. However, Carson-Roberts, our partners in Los Angeles, tell us that animation can be helpful when you are talking to children. They should know – they have addressed more than six hundred commercials to children. 25. Headline. On the average, five times as many people read the headline as read the body copy. It follows that, if you don’t sell the product in your headline, you have wasted eighty percent of your money. That is why most Ogilvy and Mather headlines include the brand name and the promise. 26. Benefit in headlines. Headlines that promise to benefit sell more than those that don’t. 31. Select your prospects. When you advertise your product which is consumed by a special group, it pays to flag that group in your headline – MOTHERS, BED-WETTERS, GOING TO EUROPE? 36. Use captions to sell. On the average, twice as many people read the captions under photographs as read the body copy. It follows that you should never use a photograph without putting a caption under it; and each caption should be a miniature advertisement for the product – complete with the brand name and promise. 37. Editorial layout. 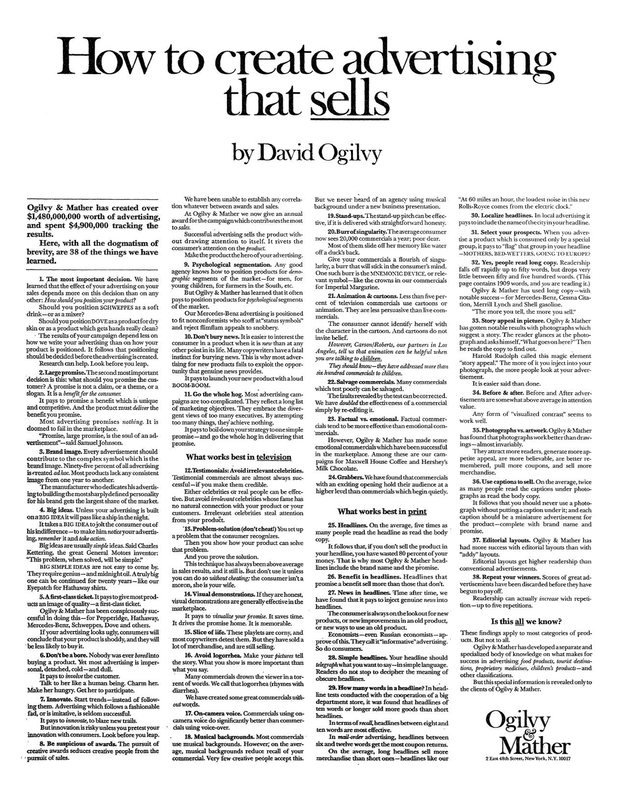 Ogilvy & Mather has had more success with editorial layouts, than with “addy” layouts. Editorial layouts get higher readership than conventional advertisements. If you’re interested in learning more, check out David Ogilvy’s books Confessions Of An Ad Man and Ogilvy on Advertising. You do want to write better, don’t you? Try The Copywriter’s Handbook: A Step-By-Step Guide To Writing Copy That Sells.